Izu Ōshima (伊豆大島, Izu-ōshima) is an inhabited volcanic island in the Izu archipelago in the Philippine Sea, off the coast of Honshu, Japan, 22 km (14 mi) east of the Izu Peninsula and 36 km (22 mi) southwest of Bōsō Peninsula. 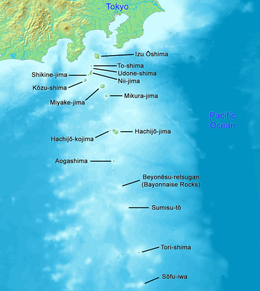 As with the other islands in the Izu Island group, Izu Ōshima forms part of the Fuji-Hakone-Izu National Park. Izu Ōshima, at 91.06 km² is the largest and closest of Tokyo's outlying islands, which also include the Ogasawara Islands. The island is a stratovolcano with a basaltic composite cone, dating from the late Pleistocene period, between 10,000 and 15,000 years ago. It rises from an ocean floor with a depth of between 300 and 400 meters. The island has a roughly circular coastline of approximately 52 kilometers in length. The highest elevation, Mount Mihara (三原山, Mihara-san), is an active volcano with a height of 758 meters. The mountain has been recorded to have erupted numerous times through history and is mentioned as far back as Nara period written records. Major eruptions occurred in 1965 and 1986, each forcing the temporary evacuation of the inhabitants. The last recorded eruption was in 1990. The epicenter of 1923 Great Kantō earthquake which devastated Tokyo and the surrounding region was deep beneath Izu Ōshima Island. It was often said that humans had first settled on Izu Ōshima about 8,000 years ago. Mt. Mihara, which towers over the middle of the island, was known to have erupted multiple times over the centuries. Today, the mountain is still revered and viewed with awe and respect as a Gojinka (fire of the gods). On 26 June AD 699, En no Ozuno, an ascetic and mystic who became the founder of the folk religion Shugendō was banished to Izu Ōshima by the Imperial Court after he had been accused of practicing magic. The island then remained a penal colony until the Edo period (1603-1868). Izu Ōshima has a humid subtropical climate (Köppen climate classification Cfa) with warm summers and cool winters. Precipitation is abundant throughout the year, but is somewhat lower in winter than the rest of the year. The island is administered by the Ōshima subprefecture of the Tokyo Metropolitan government. Ōshima Town (大島町, Ōshima-machi) serves as the local government of the island. Ōshima Town consists of the six traditional hamlets of Okata (岡田), Motomachi (元町), Senzu, Nomashi, Sashikiji and Habuminato (波浮港), with Motomachi as the administrative center. Izu Ōshima is a popular site for tourists from both Tokyo and Shizuoka due to its close proximity to the mainland. There are a number of ferries which leave from Takeshiba Sanbashi Pier, near Hamamatsuchō, Tokyo. Ferries also leave from Atami in Shizuoka. There are several flights per day from Ōshima Airport to Chōfu Airport in Chōfu. Mount Miharu and Izu Ōshima featured prominently in The Return of Godzilla, as the location in which the Japanese government entombed Godzilla. Mt. Mihara appeared again in the direct sequel, Godzilla vs. Biollante, in which Godzilla was released when the volcano erupted. Mt. Mihara and Izu Ōshima were also featured in Koji Suzuki's Ring and its film adaptation as pivotal locations for the story. In the Pokémon franchise, Cinnabar Island is based on Izu Ōshima. ^ Tokyo Islands "Oshima island"
Wikimedia Commons has media related to Izu Ōshima. Wikivoyage has a travel guide for Izu Ōshima.